Is Turkey trying to suffocate life in Kobani again? The only thing the administration of Kobani can do is to plead with Turkey to open a customs gate at the border, so not only people, but also materials can pass through. But Turkey doesn’t listen to Kobani’s pleas. What this implies really disturbs me. 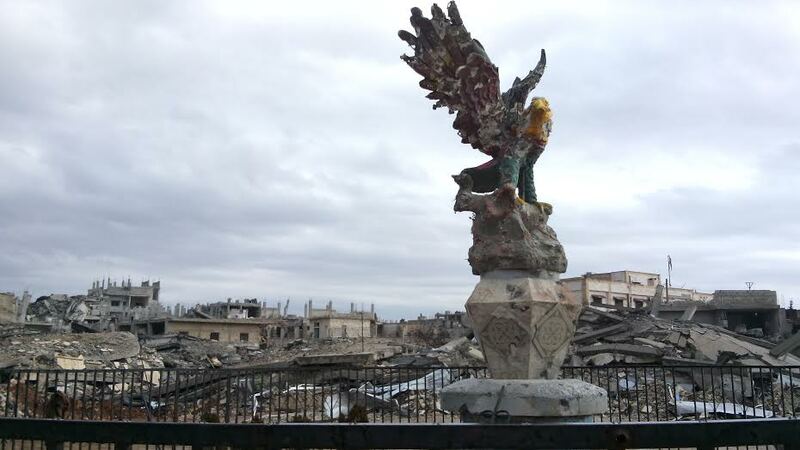 Destruction around Freedom Square, Kobani, January 2015. Photo: Fréderike Geerdink. Click to enlarge. How many citizens of Kobani have now returned to the liberated but destroyed city and surrounding villages is unclear. Not everybody who returns stays. Some return to Turkey when they see normal life is not reasonably possible yet, or when they find their house fully destroyed. Some people may ‘return’ several times through Mürsitpinar border gate, going back and forth between Turkey and Kobani (and coming back to Turkey often via illegal ways). There are no statistics. At the conference, held in Diyarbakir, there were statistics presented about the state of Kobani. The ‘loss assessment’ was thoroughly drawn up by the Diyarbakir branch of the Chamber of Engineers and Architects (TMMOB). To pick out a few of the figures: residential neighbourhoods are destroyed sometimes for 50% and sometimes for even a staggering 98%, about half of all the houses are flattened and the other half are standing but badly damaged. Of 46 public buildings 30 are damaged but reparable and 16 are beyond repair, 80% of tractors used for agriculture are destroyed, most of the 1 million fruit trees are damaged and all 370,000 chickens are dead. All four hospitals are unusable, and in their place there is one small clinic that hardly has any materials to help patients. That’s what returnees go back to. And there are other physical consequences of the war not even mentioned yet: land mines that ISIS left in houses (which have already killed and wounded several citizens), rotting and disease-spreading corpses that have not all been found and cleaned up yet, a destroyed sewer system and a lack of clean water, both posing health threats. 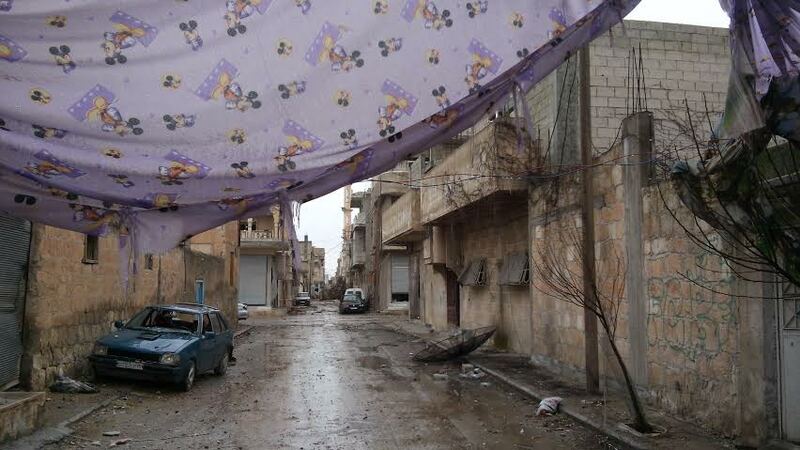 Street in Kobani, January 2015. 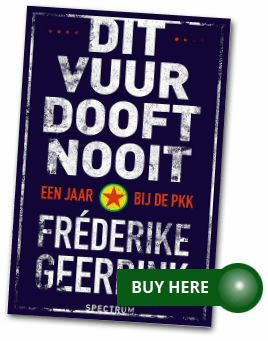 Photo: Fréderike Geerdink. Click to enlarge. You could say it is not very responsible of citizens to go back to Kobani while the city is still in this dire situation, but that wouldn’t be very helpful. The fact is, people are returning. Turkey allows Kobani citizens to pass through Mürsitpinar, and people with certain professions (like doctors, for a maximum three days) or from associations (like the architects from the TMMOB, and lawyers from the Bar Association), and politicians, but that’s it. Journalists are not allowed in, by the way, so unless I cross the border illegally (which I won’t), there is no way to check out the situation myself. But items that Turkey does not allow in, to mention a few, are construction materials, hospital needs, land mine detection and destruction teams, agricultural machinery, or, in short, everything that would improve people’s lives, make life in Kobani healthier or directly protect lives. Can you picture it? Anybody who wants to return is permitted by Turkey to pass, but after that, they have to take care of themselves without any help from abroad allowed to reach them. Meanwhile, the conference was bursting with energy, with the will to start rebuilding the city and surrounding villages (which have not all been liberated yet) and was bustling with ideas to make the city sustainable and ecological, in line with the Social Contract of Rojava, of which Kobani is a part. After visiting Kobani at the end of January, after talking to many refugees who do want to return, after visiting this conference and hearing all the time about the border problem, I wonder: what is Turkey trying to do? Suffocate, destroy life in Kobani once again?